Gone are the days when you had to setup every section of the site step by step in WordPress. With this theme, you simply activate the theme and voila, you can start adding news, description, images, widgets, blog posts, pages and every element is set out of the box. The theme adds these dummy element for you so you can easily locate them and edit as per your wish (or delete everything with single click if you wish). The homepage of the theme is customizable via dynamic widgets which are built specially for this theme. Designed strategically, the structure of the page is done in such a way that gives maximum exposure to essential elements. Your visitors can vote for articles which they like. Now create the hype and let everyone plus one your article. Afterwards they can also minus one, incase they change their mind. Your visitors can register on the site and then submit articles. They can submit the article and can even upload an image. You can even change the status of those submitted articles to automatically publish or set to draft. Design settings are integrated in this theme. Now you can control various elements of the theme through Design panel. Change font color, link color, body background color, and many more settings, without even touching the code. In detail page we have focused on typography. Users can vote from detail page also. Your post can even go viral with the help of various sharing options beneath each post. You don’t need to add any social media plugin, as its all included here. You can use 30 different shortcodes, anywhere. The beauty of shortcodes is that they can be used anywhere. They are built in, if you want to use then just type in that particular code and voila, your job is done ! 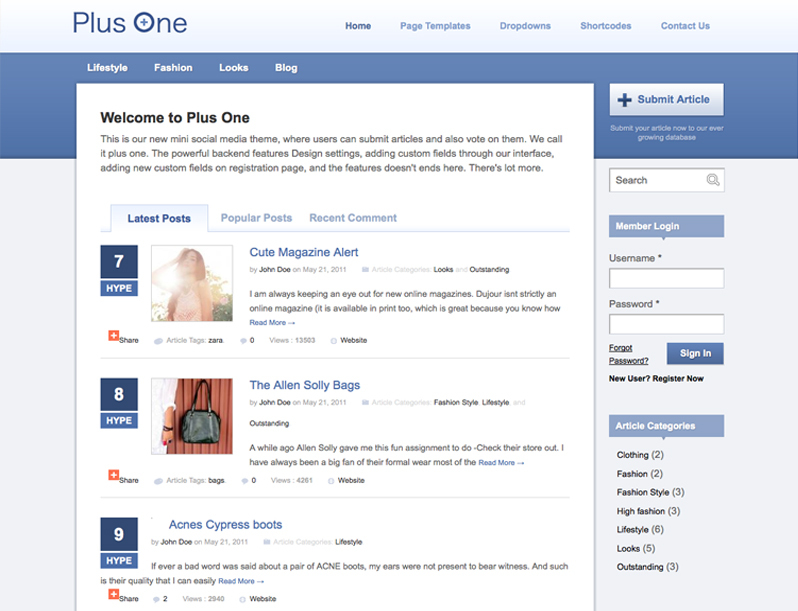 Why buy this PlusOne theme? Because this is the best WordPress theme so far of its kind. With this theme, you can create a clean looking, Mini social site, where users can vote for articles. We have focused on the content very thoughtfully, neglecting the not so important stuff and including only the necessary features with the best usability and easy of use. Yes, take the right decision. Save time, money and hassles. Create a site easily using this theme. Buy Now and Start a site immediately.